Ó Dochartaigh B É,Doce D D, Rutter H K and MacDonald A M. 2015. 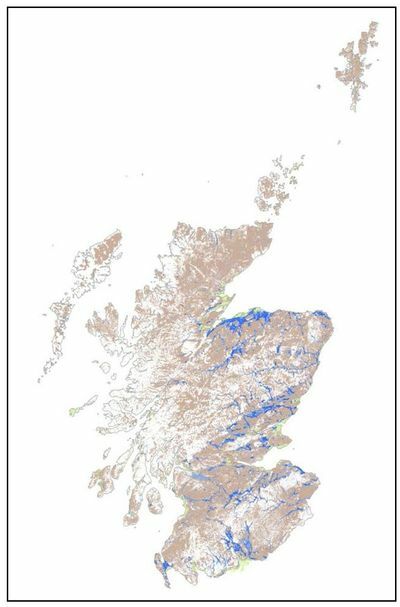 User Guide: Aquifer productivity (Scotland) GIS dataset, Version 2. Revised Report. British Geological Survey Internal Report, OR/15/003. The aquifer productivity (Scotland) datasets, Version 1, were produced in 2004 by the British Geological Survey (BGS). The datasets comprised GIS-based aquifer productivity maps and an associated report with explanatory notes (MacDonald et al. 2004). This revised version (Version 2) has used updated geological linework and a slightly modified methodology to develop new GIS-based maps. Related BGS datasets that the user may also be interested in are a GIS-based map of groundwater vulnerability for Scotland (Version 2) (Ó Dochartaigh et al. 2015); permeability index datasets (British Geological Survey 2010); superficial deposits thickness datasets (Lawley and Garcia-Bajo 2009); and DiGMapGB-50 (the Digital Geological Map of Great Britain at 1:50 000). A related external dataset is the Hydrology of Soil Types (HOST), available through the James Hutton Institute (Boorman et al 1995; http://www.macaulay.ac.uk/host). Related aquifer productivity studies and publications by BGS are Graham et al. (2009), MacDonald et al. (2005) and Ó Dochartaigh (2004). The aquifer productivity maps describe the potential of aquifers across Scotland to sustain various levels of borehole water supply, and the dominant groundwater flow types in each aquifer. The productivity classifications are based on a judgement of the typical long term sustainable abstraction rate from a properly sited, constructed and developed borehole (or, for superficial deposits, a group of boreholes). However, the complexity and heterogeneity of geological formations means that these classes are only a guide. In addition, random drilling within an aquifer without reference to suitable hydrogeological information may not produce the yields indicated by these classes. The bedrock aquifer productivity map has five aquifer productivity classes (very high, high, moderate, low and very low); and three groundwater flow categories (significant intergranular flow; mixed fracture/intergranular flow; and fracture flow) (Table 1, Figure 1). The superficial deposits productivity map has four productivity classes (high; moderate to high; moderate; and a category to signify that a deposit is ‘not a significant aquifer’) (Table 2, Figure 2). All superficial deposits aquifers in Scotland are assumed to have primarily intergranular groundwater flow (although fracture flow may be important in some glacial tills that are classed as ‘not significant aquifers’). How can the datasets be used? The aquifer productivity maps are a tool to indicate the location and productivity of aquifers across Scotland. They have been used to help characterise groundwater bodies as required by the Water Framework Directive. They are designed to be used at a scale of 1:100 000, and not to assess aquifer conditions at a single point. As such, they provide only a guide to aquifer conditions, and are not a substitute for detailed site investigation. To improve awareness of groundwater in general. Figure 1 The bedrock aquifer productivity (Scotland) map. Figure 2 The superficial deposits aquifer productivity (Scotland) map. Unknown Geology - Areas where geology is unmapped, for example beneath lochs. Intergranular Flow; High Productivity > 10 l/s Glaciofluvial sand and gravel; mixed glaciofluvial deposits; glacial ice-contact deposits. Intergranular Flow; Moderate to High Productivity 1 to >10 l/s2 Alluvium and river terrace deposits, unless specified as clay and silt. Intergranular Flow; Low to Moderate Productivity 0.1 to 10 l/s3 Marine, raised marine, blown sand, lacustrine beach despots, tidal and intertidal deposits, unless specified as clay and silt4; talus; landslip; blockfield5. Not a significant aquifer - Till; moraine; hummocky/moundy glacial deposits6; head7; lacustrine deposits where dominated by clay and silt; all other deposits dominated by clay and silt. Unknown Geology - Areas where geology is unmapped, for example beneath lochs or in urban areas. 2This classification includes aquifer deposits which can range from Moderate Productivity, with typical borehole yields between 1 and 10 l/s, to High Productivity, with yields greater than 10 l/s. 3This classification includes aquifer deposits which can range from Low Productivity, with typical borehole yields between 0.1 and 1 l/s, to Moderate Productivity, with yields between 1 and 10 l/s. 4Any mixed deposit of marine or tidal origin, if not specified as clay and silt, may have the potential to form a moderately productive aquifer capable of supplying sustainable borehole yields of at least 1 l/s, if it contains sufficient sand and/or gravel, is thick enough and is of large enough lateral extent. The user of the map should judge the spatial extent of the outcrop as well as (in conjunction with topographic mapping) the proximity to and height above sea level (related to the risk of saline intrusion), and should carry out site investigations to discover the thickness and exact lithology of the deposit. 5Talus and blockfield deposits are typically highly permeable and, if thick enough, can store and transmit enough groundwater to supply spring flows of between 1 and 10 l/s. Because of their geometric configuration – typically steeply dipping – drilling into them by conventional means is unlikely to be successful, but inclined drilling or abstraction from shallow dug wells, as well as springs, may provide supplies. 6Recent evidence suggests that moraine and hummocky/moundy glacial deposits are often highly permeable. 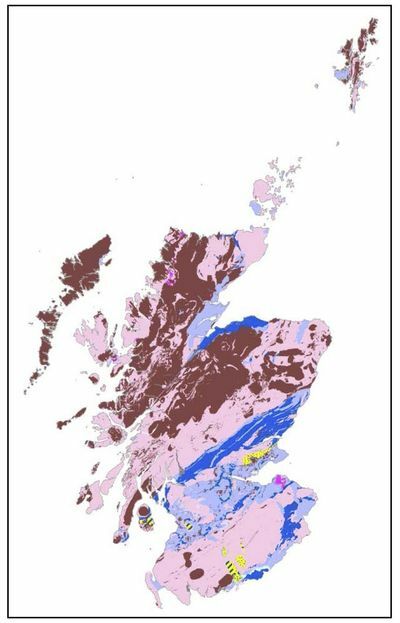 However, across much of Scotland, except where the superficial deposits have been re-mapped using modern methods, moraine, hummocky/moundy glacial deposits and till are all mapped interchangeably as till, and their lithology typically described as diamicton (classed as moderate permeability in the BGS Permeability Dataset for Great Britain (British Geological Survey 2010). On a national scale, it is therefore not generally possible to distinguish between till and moraine on the basis of the available lithological descriptions. For the purposes of consistency, this map classes all till, moraine and hummocky/moundy glacial deposits as Not a Significant Aquifer. Note, however, that in some areas these deposits may be highly permeable, and if they are thick and laterally extensive enough, they may form local aquifers. 7The lithology of head depends on the parent material from which it has been reworked. In general it is thought to have a permeability between that of till and sand/gravel deposits. In the BGS Permeability Dataset its permeability varies from moderate to very high according to the described lithology. However, head is typically only 1 to 2 m thick, and so is unlikely to form a significant aquifer. Who might benefit from using the datasets? The aquifer productivity maps were originally developed for use by the Scottish Environment Protection Agency (SEPA) in the process of groundwater body characterisation as part of the Water Framework Directive. Other potential users of the dataset may be regional planners and managers in Local Authorities and national government. Any individuals or bodies involved in the activities listed in How can the datasets be used? section are likely to find the aquifer productivity datasets useful. ↑ 1.0 1.1 MacDonald A M, Ball D F and Ó Dochartaigh B É, 2004. A GIS of aquifer productivity in Scotland: explanatory notes. BGS Commissioned Report CR/04/047N. ↑ Ó Dochartaigh B É, Doce D D, Rutter H K and MacDonald A M. 2015. User Guide: British Geological Survey Groundwater Vulnerability (Scotland) GIS dataset, Version 2. British Geological Survey Open Report (OR/15/002). ↑ Lawley R and Garcia-Bajo M. 2009. The National Superficial Deposit Thickness Model (version 5). British Geological Survey Internal Report OR/09/049. ↑ Boorman D B, Hollis J M and Lilly A. 1995. Hydrology of soil types: a hydrologically-based classification of the soils of the United Kingdom. Institute of Hydrology Report No.126. Institute of Hydrology, Wallingford. ↑ Graham M T, Ball D F, Ó Dochartaigh B É and MacDonald A M. 2009. Using transmissivity, specific capacity and borehole yield data to assess the productivity of Scottish aquifers. Quarterly Journal of Engineering Geology and Hydrogeology 42, 227-235. ↑ Ó Dochartaigh B É. 2004. The physical properties of the Upper Devonian/Lower Carboniferous aquifer in Fife. British Geological Survey Internal Report IR/04/003. ↑ British Geological Survey. 2010. Permeability Indices (PI) data: Information Note, 2010: Permeability Index – Version 6.0. British Geological Survey Information Note. Accessed from http://www.bgs.ac.uk/products/hydrogeology/permeability.html, 11 October 2011. This page was last modified on 23 July 2015, at 16:21.